Tourism Department of Assam has decided to use three N.F. Railway trains to promote its “Awesome Assam” branding. Use of Indian Railway train to promote brands and products is an innovative idea , Realising the potential, Tourism Department of Assam has decided to use three N.F. Railway trains to promote its “Awesome Assam” branding. 12552 / 12551 Kamakhya – Yasvantpur – Kamakhya AC Express today became the first such train in whole Indian Railway to be fully branded with a State Government publicity campaign. 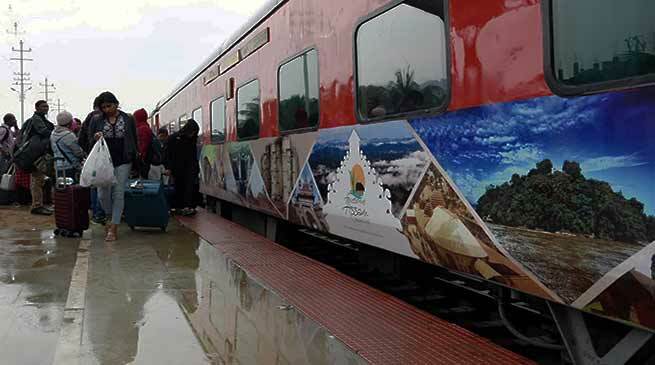 The newly branded train was flagged off by Chandan Brahma, Minister of Tourism, Govt. of Assam, Jayanta Malla Baruah, Chairperson, Assam Tourism Development Corporation Ltd, Assam, Sanjive Roy, General Manager, N.F. Railway alongwith other senior officials of Assam govt. and N.F. Railways were present on the occasion. The idea of vinyl wrapping of trains, to tap the limitless potential of using train exteriors as a medium of advertisement was initiated by the Railway Minister. The procedures were simplified by bringing the branding tariffs based on per train basis recently. After this simplification, Assam became the first state to grab the opportunity to use this unique advertising medium by fully branding the train for propagation of the “Awesome Assam” campaign. This train plying out of Assam travels to Bangalore at a distance of 3025 km passing through many cities and towns all over India. So there is very good prospects that the campaign through train will provide a quantum boost to the tourism sector of Assam because of its high visibility. It can be mentioned here that, while the 12552 / 12551 Kamakhya – Yasvantpur – Kamakhya AC Express will cover the route towards South India, there are plan to use other trains moving to destinations like Mumbai (Western India), Katra (North India) etc for propagating the “Awesome Assam” campaign literally covering the whole country.